Do I Have a Right to Die? For the moment, forget everything you’ve ever heard about right-to-die or right-to-life positions. Put aside the court rulings. Push out of your mind the tug-at-your-heart stories you’ve seen in the movies or read about online. Now, with no one reading your thoughts, may I ask, “Do you know when it is right to die? For you? For your family?” Please, I realize this may not be a theoretical question for you. You may be one who could write a real-life tug-at-your-heart story. And you may have already made up your mind about how and when you want to die. Whatever your response, I want you to know that your decision matters. It matters more than you realize. Let me explain. Since at one time I served on a national council that drafted major civil rights legislation, my husband, Ken, then a high school government teacher, asked me to speak to his classes on the subject of legalizing euthanasia. This was well before California had legalized medically assisted death, but plenty of initiatives were testing the waters. Ken wanted me to talk to his students about the implications of a right-to-die law. The classroom was crowded with kids standing along the back and leaning against the chalkboards covering the walls. A few hands went up. I could tell by their answers that they felt society should take action to help hurting and dying people—some students insisting on life no matter how burdensome the treatment, and a few wanting to help by hurrying along the death process. “Like what?” I playfully challenged. And that’s how much your point of view matters. You may be the one who fiercely advocates pulling the plug, or the one who fights to keep a heart pumping until the bitter end. Whichever it is, you must, in the words of John Donne, know this: no man is an island. We are such private people. We would like to be able to make a life or death decision in a vacuum or even at an arm’s-length distance from others. But we can’t. Your point of view and how you act on it, let’s say as you lie in bed with a terminal illness, not only matters to you and your family; it matters to a wide network of friends and associates as well. In other words, to society. The cultural drift is channeled by your decision to either pull the plug or hold on to life. In fact, will you permit me to get personal? If you can, dismiss your real-life circumstances for a moment. Let’s pretend you are in bed with a terminal illness, and doctors say you could live for another six months. Your pain can be effectively managed. And you have an opportunity to make a choice about medical treatment. You can decline treatment if you want—and you even live in a state whose laws permit you to request a medically assisted death. Your family says it’s up to you. I know it’s hard to pretend such an antiseptic situation, devoid of real grief and actual anguish, because distress would play a key role. But given this sterile scenario, what would you do? What would you say? I hear what you’re saying. But when people maintain that their death is their own business and the business of “those I love,” they do not consider the significance of their decision on the wider circle of life. A decision to cut life short, even if only a few months, does not stop with “those I love,” but affects a whole network of relationships: friends, former colleagues, teachers, distant family members, casual acquaintances, and even nurses and doctors who occasionally stop by your bedside. If you believe your decision is private and independent, think again. Your choice to speed up the dying process is like playing a delicate game of pick-up sticks. You carefully lift a stick, hoping not to disturb the intricate web. But just when you think you’ve succeeded, your independent action ends up jiggling the fragile balance and sending other sticks rolling. True, because you are a mentally competent person, the judge would probably bang the gavel in your favor. Like you said, you have rights, and you may end up literally dying for them. But like all other liberties, your choice is not absolute—no ifs, ands, or buts. Your self-determination to die has strings attached if it adversely affects the rights of others. That’s why more than half the states in our country have laws against aiding a person in suicide. Even states that have legalized physician-assisted suicide still have laws against just anyone assisting. And also, these laws insist—though not always followed in practice—that the patient be in the final six months of a terminal illness and be able to make the final action that brings about their death. Why all the legal safeguards? Think it through: if everybody ended their life as a solution to problems, the very fabric of our society would ultimately unravel, and with it all the other individual rights we enjoy. Yes, you have a glistening right of privacy, as long as it does not overshadow the rights of others. But legalized euthanasia can seriously infringe on the rights of many physicians. You might want to exercise a right to die, but do you have the right to ask a physician, whose duty is to heal, to comply with your wishes or even to make a referral? No person, in the name of self-determination, should be able to oblige a doctor to prescribe a fatal dose when it goes against the physician’s oath to “do no harm.” Yet already we have seen lawsuits against doctors who refuse to assist in hastening a patient’s death. Or again, in death with dignity acts, there is no requirement that next of kin be notified before a person follows through on his or her plan to hasten death. Shouldn’t parents, a spouse, or children have the right to know before their loved one is beyond their reach? But wait, it sounds a little like we’re trading baseball cards here. Our rights are not things that can be exchanged, bargained over, or transferred like property. Essentially, rights are moral claims to be recognized by law, not things to be traded. And moral claims have to take into account responsibility, limits on freedom, and ethical standards that reflect the good of the entire community. When we clamor about the sanctity of our individual rights, we may be reinforcing an all-too-human failing, namely, the tendency to place ourselves at the center of the moral universe. If taken to the extreme, clamor over individual rights can lead to one indignation after another about the inherent limitations of society, and we will never be satisfied. The fact is, true rights are based in God’s moral law. Proverbs 31:8–9 reads, “Speak up for those who cannot speak for themselves, for the rights of all who are destitute. Speak up and judge fairly; defend the rights of the poor and needy.” But take God out of the picture, and rights become nothing more than people’s willful determinations dressed up in the language of “rights” to give them a showy kind of dignity. Then the exercise of rights becomes nothing more than a national competition between who is more victimized than whom. As I shared in my husband’s government class, “You, my friend, are society.” So welcome to the club of community, and even though some may try to drown out other styles of discourse with shouts about personal rights, the community may have a thing or two to say, and it may say it a lot louder. After all, community can only progress when its individuals exercise higher moral choices, and community is sacrificed when individuals choose with only themselves in mind. Taken from When Is It Right To Die? 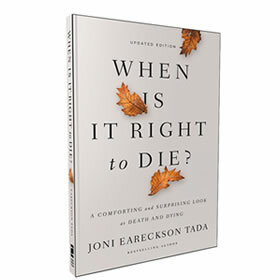 A Comforting and Surprising Look at Death and Dying by Joni Eareckson Tada. Click to learn more about this title. When Is It Right to Die tells the stories of families who have wrestled with end-of-life questions. Behind every right-to-die situation is a family. A family like yours. 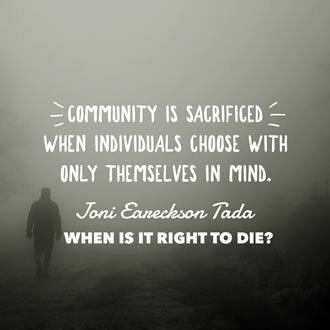 In her warm, personal way, Joni takes the reader into the lives of families and lets them speak about assisted suicide. What they say is surprising. Joni Eareckson Tada knows the struggle of dealing with daily pain and suffering since a diving accident in 1967 left her paralyzed from the neck down. She is the CEO of Joni and Friends, an organization that accelerates Christian outreach in the disability community, provides practical support and spiritual help to special-needs families worldwide, and equips thousands of churches in developing disability ministry. Joni is the author of numerous bestselling books, including Joni (her autobiography), When God Weeps, Diamonds in the Dust, and A Spectacle of Glory. Joni and her husband, Ken, have been married for 35 years. 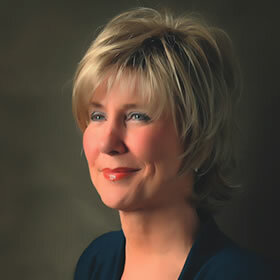 For more information on Joni and Friends, visit www.joniandfriends.org. My friend Shannon and I wove our way through the National African American Museum of History and Culture in Washington, DC. Two days before, we’d sat at the feet of Mama Ruby, and now, on our last full day of the pilgrimage, our bodies ached with a wild kind of exhaustion. Desperate to return home, I longed for enough time to filter all of the information I’d internalized that week. Shannon longed for respite too, but hers included a recess from the pain of her body. Still recovering from double knee surgery, her legs screamed in agony. Occasionally, she walked without assistance, but sometimes she needed her walking sticks, and sometimes her wheelchair. That day in the museum, her body begged for the comfort of her chair. We were mostly silent as we wheeled through the museum, and an elevator took us to the basement, into the hulls of slave ships that transported millions of Africans from their home countries to Europe, the Americas, and beyond. We made our way through darkened, narrow passages designed to resemble the cramped living conditions of the ships. Our minds and bodies were transported to our country’s beginnings, to the 1400s, when slavery around the world was a temporary status not based on a person’s outward appearance. With each sideward glance, the wheels of Shannon’s chair clicked in rotation, just as the years ticked upward too. We traveled through the 1600s and into the late 1700s, the murals and quotes and wax depictions of each scene an aching remembrance of injustice. But when we got to 1776, we stopped and stared at an irony of massive, bolded words slapped onto the wall daring us to disagree. All men are created equal . . .
With certain unalienable rights . . . The gilded letters of the Declaration of Independence rose above the atrocities of injustice, its message the greatest paradox of liberty. Sure, the statement was true for those of us born with white skin, but it wasn’t true for everyone. By the American Revolution, slavery was an institution, a racial caste associated with African ancestry. America was a country built on the backs of slave labor and upon land stolen from the native population. Then, in 1787, the government mandated that a black person be counted as only three-fifths of a white person for purposes of determining representation in Congress. Black people were held to be less human than white people. In the eyes of the government, African Americans had not been created equal, nor did they possess certain unalienable rights, and now, nearly 250 years later, this inequality still exists. We continue to cling to hope for millions of black and brown Americans still treated like chattel by systems of injustice, for those yet to possess equal dignity in the eyes of the government and their fellow countrymen. For too long I refused to let myself see history’s one-sided affair, listening to and learning from the stories of my past, stories told from the point of view of the oppressors. But now, I didn’t know where I fit in. I’d begun to examine history through another lens. told the stories I had not always cared to hear, provided quotes I had not always taken the time to read. By the time we reached the early 1860s and stood before Lincoln’s Emancipation Proclamation, I yearned for hope, desperate for a sliver of optimism in a decree I’d long thought ended slavery once and for all. But as Shannon and I looped around the next corner, we came face to face with the Jim Crow laws, with our country’s hideous legacy of lynching, with the atrocities of sharecropping. By the time we reached the mid-20th century, I wanted to run to a dark corner and hide, crouching like a small child trying to escape, like a little girl who doesn’t want to be seen. I didn’t want to be a white woman in that space, because I didn’t want to carry the injustice—the injustice that was mine—on my shoulders any longer. I wanted a thousand absolutions to release me from the pain, to free my lungs of the sobs welling up inside. But as the hours ticked by, I knew this pain was mine to hold. No longer did I have the right to walk away or to distance myself from the atrocities. I was bound both to the stories of the oppressed and to the oppressor, to histories I couldn’t rewrite and to futures I desperately hoped to change. A month later, Shannon and I traded text messages, piecing together our experiences of the pilgrimage and of the contrasts between she who sat and she who stood. Shannon, a white woman, is the mother of six biological and adopted children, her heart a perfect blend of sass and holiness, her words a sounding board for truth. Without a doubt, she is unafraid to proclaim a gospel of verity from the mountaintops. Like me, she tries her hardest to leverage her privilege to give voice and face to the marginalized. In the museum that day, we wore matching T-shirts that said, “We are our foremothers’ wildest dreams,” but I wondered whether that was actually true for either of us. She was probably more like the worst nightmare of her ancestors, who owned and operated a southern plantation. Her parents grew up with a normalized view of segregation. They didn’t fight against it. A year before our trip, she wrote, “I haven’t been to the museum yet, but I expect there are exhibits on slavery. My ancestors include white slave owners in the South. That’s my history too.” As I wheeled Shannon through the museum that day, she examined everything through a lens not of the present but of the past, of the oppressors who rallied against the freedom and rights of African Americans. Meanwhile, I was a nightmare of a different sort: I saw the exhibits through the eyes of my husband and my children’s ancestry, of the oppressed who fought for freedom and for the rights they deserved. I looked for an escape from the pain, for a way to hide from my skin. There, I found refuge in the oneness I felt with the mother of a slain boy. Looking back, I believe Shannon and I were doing the best we could. But neither one of us realized there might be a better way, a middle road for us on our journey. We had to learn how to hold the oppressor and honor the oppressed, for love can redeem everything, including both the oppressor and the oppressed. We had to enter the fullness of lament. I don’t always readily enter lament. I often want a happy, hopeful version of Jesus, a personal savior to call my own. I want to skip entire portions of the church calendar, ignoring the dreariness of Lent and of Advent so I can get straight to the hope and glory of Easter. It’s as if I stand in my son’s preschool classroom and point to the poster of cartoon faces on the wall. Although it illustrates 30 different feelings—hysteria, sadness, anger, confusion, lovestrickenness, and boredom, among others—I often want to permanently reside in the land of happiness. I want a quick fix for my experiences of racial brokenness. I want to slap a Band-Aid® on the problem of pain, especially if I feel shame, especially if the burden of guilt lies on people who look like me. But this is no way to live, for this is no way to heal, nor is it any way to grow. We were not made to experience only a single emotion. We were created to experience a myriad of feelings, including deep pain. So we are also to be people of lament, to voice holy complaints and protests and griefs aloud, to enter the brokenness of injustice and pain. Lament teaches me to shed light on stories of sorrow, to dig up the burdens of oppression for both the oppressor and the oppressed. When tragedy strikes, I no longer ignore suffering and death in the world around me but I take notice. I pay attention to the hate, noticing the ways history has often been painted by a white point of view. But I don’t stop there. I take action. I enter the sorrow of injustice, mourning with those who mourn, weeping with those who weep. I breathe in the wounds of the unknown among me, of the immigrants and refugees and asylum seekers in my midst, of the black and brown brothers and sisters in my neighborhood and in my city whose injuries I have not cared for. I sit with the pain I have inflicted on others. I mourn the pain others have inflicted on me. No longer do we ignore the suffering and pain and death of others, but with compassion as our only sword, we listen and we enter in to heartache. We don’t bind ourselves with apathy, but we pay attention to the past and we drink of the present, eyes opened wide toward the future. Then, balancing on a scale of hope and lament, we cry out for justice and for peace, for ourselves and for the world around us. These are our fellow human beings, after all. That day in the museum, though, no part of me wanted to participate in or pass on a legacy of hate—not to my children, my husband, my brothers and sisters of color. But walking forward means embracing every part of my story, including the parts I want to forget and the parts I want to be absolved of responsibility. It means stepping into places of sorrow, letting the tears fall, dressing in uniforms of lament. 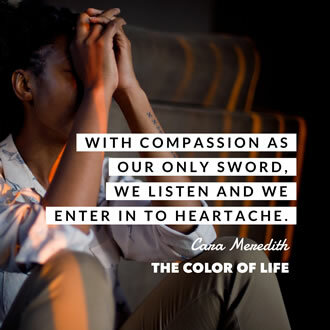 Adapted from The Color of Life: A Journey Toward Love and Racial Justice by Cara Meredith. Click here to learn more about this title. 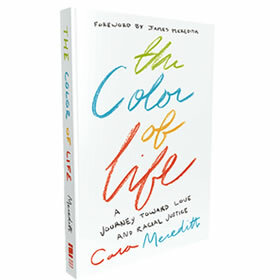 In The Color of Life, Cara Meredith, white wife of the black son of prominent civil rights activist James Meredith, asks how do we navigate ongoing and desperately-needed conversations about race? How do we teach our children a theology of reconciliation and love? And what does it mean to live a life that makes space for seeing the imago Dei in everyone? Cara’s illuminating memoir paints a beautiful path from white privilege toward racial healing, from ignorance toward seeing the image of God in everyone she meets. Cara grew up in a colorless world. From childhood, she didn’t think issues of race had anything to do with her. A colorblind rhetoric had been stamped across her education, world view, and Christian theology. Then as an adult, Cara’s life took on new, colorful hues. She realized that her generation, seeking to move beyond ancestral racism, had swung so far that they tried to act as if they didn’t see race at all. But that picture neglected the unique cultural identity God gives each person. When Cara met and fell in love with the son of black icon, James Meredith, she began to listen to the stories and experiences of others in a new way, taking note of the cultures, sounds and shades of life already present around her. After she married and their little family grew to include two mixed-race sons, Cara knew she would never see the world through a colorless lens again. 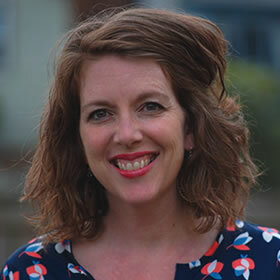 Cara Meredith is a writer and speaker whose work has appeared in numerous print and online publications, including Christianity Today, iBelieve, and For Every Mom. A former high school English teacher and outreach ministry director, she holds a Masters of Theology from Fuller Seminary. She lives in the San Francisco Bay Area with her husband and two sons. Learn more at www.CaraMeredith.com.